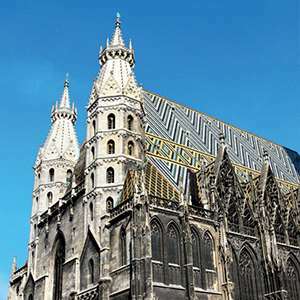 Billy Joel wants to know, “When will you realize... Vienna waits for you?” Maybe you’ve heard the song and know Vienna waits, but you didn’t want to deal with the hassles that come with planning a vacation. Well, now you don’t have to, because Monograms has made it easy for you to travel to Vienna as well as Munich. On this 7-day vacation, we've arranged your hotel reservations, sightseeing, transportation between cities, daily breakfast, and transfers from/to your hotels to/from the train stations. Plus, in each city you’ll have a Local Host®, someone who is there to answer your questions, offer you guidance, and help ensure your vacation runs smoothly. Your vacation begins when you arrive in Vienna, where we can pick you up at the airport and take you to your selected hotel. Here, your Local Host will help you get settled and present you with materials, so you can start exploring the city immediately. 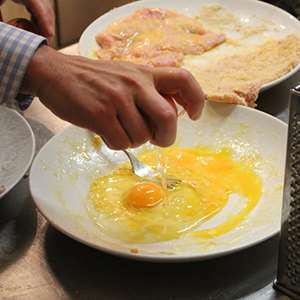 The next morning, after included breakfast, we’ll pick you up at your hotel for guided sightseeing with a local expert, someone who will share the city’s inside stories and who knows what it is like to live in the city. Your sightseeing features Schönbrunn Palace, the former summer residence of the Habsburg Dynasty. Just wait until you see the opulence and splendor in this palace! In Munich, your sightseeing with a local expert includes stories about the Oktoberfest grounds and a visit to BMW World. 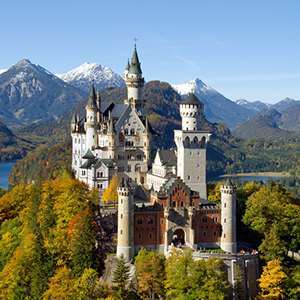 You'll also visit the park at Nymphenburg Palace, summer residence of the former Bavarian royalty, and you'll enjoy watching the famous Glockenspiel in Marienplatz, Munich’s central square. In both cities, you’ll have a free day to explore on your own (with the support of your Local Host, of course). From Vienna, you may want to take an excursion to nearby Bratislava, capital of Slovakia; visit one of the many museums; ride the Ferris wheel at Prater park, a symbol of Vienna; or just enjoy one of the many coffee houses. In Munich, perhaps visit the Residenz Museum, former Wittelsbach residence and now one of Europe’s finest palace museums; take an excursion to Linderhof and Neuschwanstein Castles; or just relax at a Biergarten with one of the local Bavarian beers. 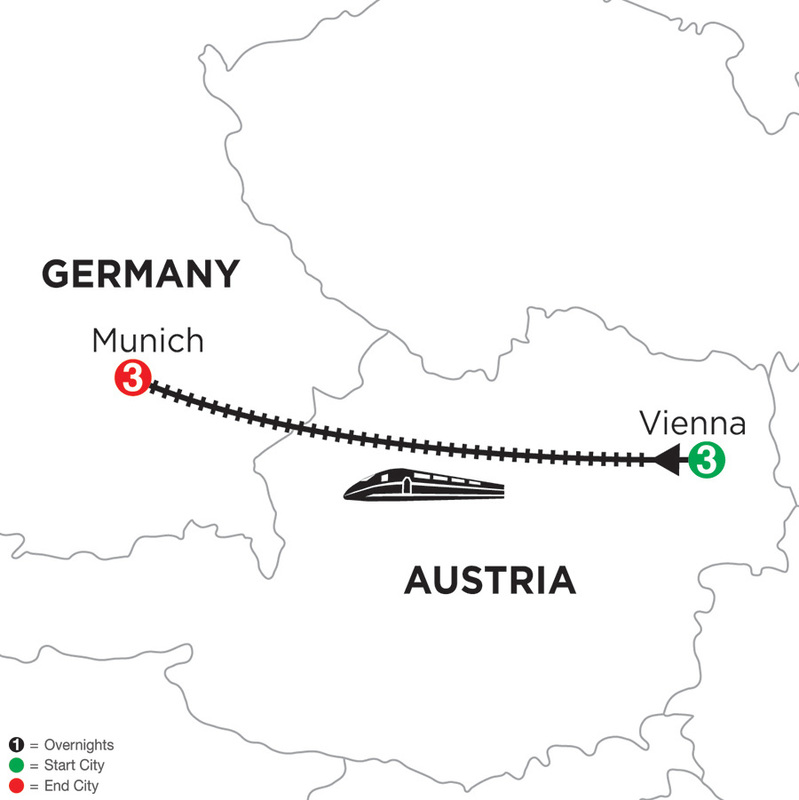 And don't forget…your package includes travel via the high-speed train (first-class) from Vienna to Munich. We’ll also pick you up at your Vienna hotel, transfer you to the train station, help you get on the correct train, pick you up at the Munich train station, and take you to your Munich hotel. It's just another service we offer to ensure your vacation is stress-free and fun! In fact, between the transportation and transfers we've included, the sightseeing and guides we've arranged, and the hotels we've booked, the only thing you’ll have to focus on is which beer to try in Munich! Add the comfort of knowing you’ll have a Local Host in each city to assist you, and you've got yourself a wonderful vacation. Just remember…Vienna—and Munich—wait for you! Your Monograms package includes travel via high-speed train from Vienna to Munich. Your mid-afternoon arrival in Munich gives you time to enjoy the day. Willkommen—welcome to the home of wonderful music, Sigmund Freud, great museums, and unique architecture. Your Local Host is available to help you maximize your time. Today you will have many options. 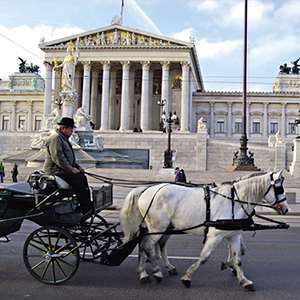 Perhaps visit the Spanish Riding School, the Sigmund Freud Museum, or the Imperial Crypt—and don’t forget to sample the famous Apfelstrudel. The choice is yours, and the Local Host is there to assist you. Travel to Munich by HIGH-SPEED TRAIN (first class). On your morning guided sightseeing, see the Oktoberfest grounds, the 1972 Olympic Park, gothic Frauenkirche cathedral, and learn about German luxury cars at BMW World. Drive by baroque Nymphenburg Palace, summer residence of former Bavarian royalty, and spend time in its magnificent PARK. Admire the Old and New Town Halls in MARIENPLATZ with the famous Glockenspiel. 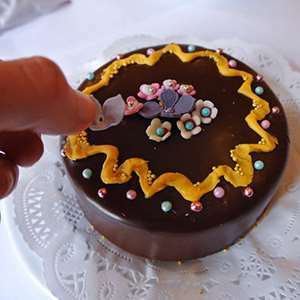 Your Local Host will have many suggestions for your time in the Bavarian capital, such as a visit to the baroque Asamkirche (Asam Church) or where to shop for traditional souvenirs. Conveniently situated in the centre of this Bavarian metropolis near the Karlsplatz shopping area and in close proximity to the fairytale gothic architecture of the historical Old Town. 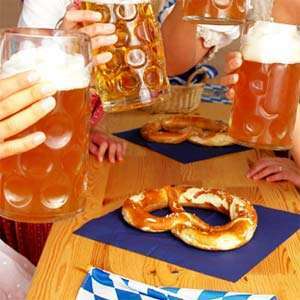 Restaurants, cafés and traditional beer gardens can be found in abundance. The stylish guestrooms include bathrobe and slippers. 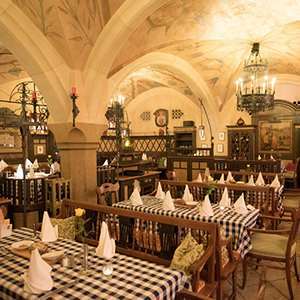 Enjoy a hearty meal of traditional Bavarian fare at the historic beer mall on the incomparable Marienplatz. 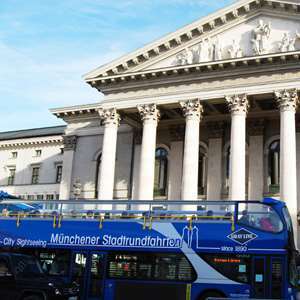 Experience Munich's main attractions the easy way on this fun and flexible hop-on/hop-off city sightseeing tour. 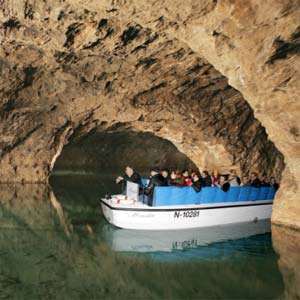 Explore Munich the way you want on this private guided sightseeing tour. Just decide what you want to see and do with your expert guide-the choice is yours! 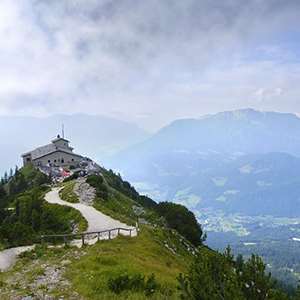 Travel through fresh mountain air and unbelievable scenery to Berchtesgaden for a visit of Adolph Hitler's infamous Eagle's Nest command post. Discover magical Munich at night during this enchanting dinner and sightseeing tour featuring the city's illuminated icons and an ascent up Olympic Tower for unforgettable panoramic views! Get a firsthand look at Munich's rich beer heritage as you visit the historic Spaten Brewery and enjoy a beer tasting with light snacks. 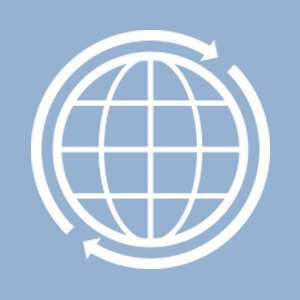 Monograms provides traveler’s access to a Local Host®, so you will have someone on hand to answer those vacation questions pertaining to Munich and Germany. No waiting in line at the concierge desk or trying to ask your waitress at breakfast directions to the shopping district. Simply ask your Local Host® about Munich and you'll be on your way in no time. Plus, your Local Host® will share local Munich insights and share suggestions for getting off the beaten path, leaving you more time to create lasting vacation memories that are yours alone. My name is Hanna and I am the Monograms Local Host® in Munich. 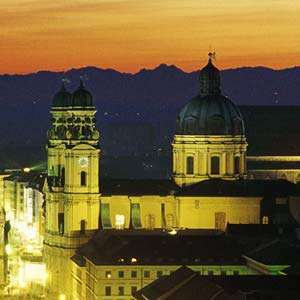 The capital of Bavaria is a fascinating place to visit and one of the most livable cities in the world. I love it and have lived here for over 20 years! Munich has plenty to offer ? culture, city parks, night life, architecture, beer gardens, shopping, and stunning nature nearby. I look forward to introducing all of this to you and making your visit to Munich an enjoyable experience. Munich has over 50 museums; ask your Local Host for information according to your interests. Some favorites are: Alte Pinakothek is a glorious museum with an immense collection of paintings from the greatest European artists of the 14th through the 18th centuries. See a self-portrait by Rembrandt and a Madonna by Leonardo da Vinci. Families and the technically-minded will love spending a few fascinating hours viewing the master works of Science and Technology at the Deutsches Museum (German Museum). Reopened in 2013 after a 4-year renovation, the Lenbach Museum contains a variety of works by Munich painters and contemporary artists, such as Wassily Kandinsky, Gabriele Münter, Franz Marc, August Macke, Marianne von Werefkin, and Paul Klee. Wander the themed rooms of the Stadtmuseum. The collections include puppet theaters, thousands of musical instruments from around the world, more than 500,000 photographs, and a history of brewing. Villa Stuck designed by the artist and owner Franz von Stuck, incorporates floors, ceilings, and walls into a single beautiful work of art. The brothers Cosmas Damian & Egid Quirin seemed divinely inspired when they created a baroque church for themselves, which turned out so magnificent that their 18th century compatriots forced them to make it accessible to the public. From the ornate façade to the ceiling fresco of St John Nepomuk, nearly every inch is a delight. Visit the former royal palace of Bavarian monarchs and stroll through the Schatzkammer (Treasury) halls. You’ll see lavish crowns from generations of monarchs, scepters and ceremonial swords, table wear and extravagant crafts from China, India, Iran, Mexico, and Turkey. The Müncher Tierpark was founded in 1911 as the first “geo-zoo” in the world with approximately 460 species and about 5,000 animals. At any time of year, its changing moods offer an impressive glimpse into the natural habitats of the protected landscape of the Isar floodplains. The animals are comfortable thanks to the species-appropriate approach. Without distracting bars and fences, the visitors can observe the animals with ease. It’s hard to imagine leaving Munich, home of the Oktoberfest, without a traditional German beer stein. Other traditional souvenirs include Black Forest cuckoo clocks, music boxes, nutcrackers, lederhosen and felt hats. Countless beer gardens populate the city, and it’s a great chance to relax with the locals. Seats beneath shady trees are plentiful, and there’s a wide variety of beers to choose from. Local food specialties include sauerbraten (marinated beef dish), dumplings and sauerkraut, Weisswurst (sausage), Kartoffelpuffer (potato pancakes), and Kaiserschmarrn (sweet pancakes with raisins, rum, and almonds). Taste one of Germany’s famous white wines particularly the Riesling; also try Apfelwein (apple wine), radler (a mix of beer and German-style soda or lemonade) and spezi (German orange cola). 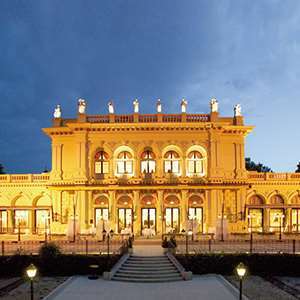 Opera and Dance is an international language, as an opera lover you will feel at home in Munich immediately; or listen to live music at one of Munich's many concert halls where music of all styles and for all tastes is played regularly. Ask your Local Host for more details.